The end of the year is a typical time to reflect on the activities of the year. 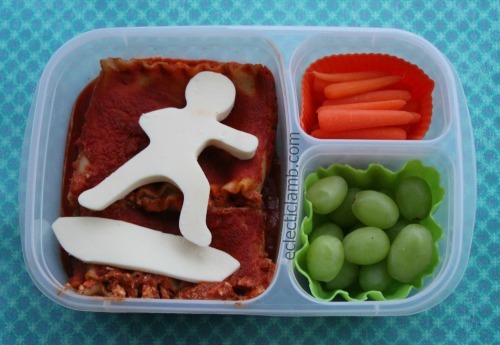 I reviewed all of the lunches I made (there were a lot!) and selected the top 16 to share today. 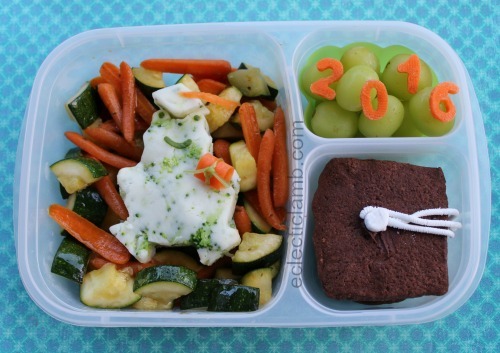 These lunches are particularly meaningful this year because in December my life drastically changed. I am glad to have this blog as a scrapbook of memories. I have made a lot of sheep/lambs and continue to find new ways to make them. 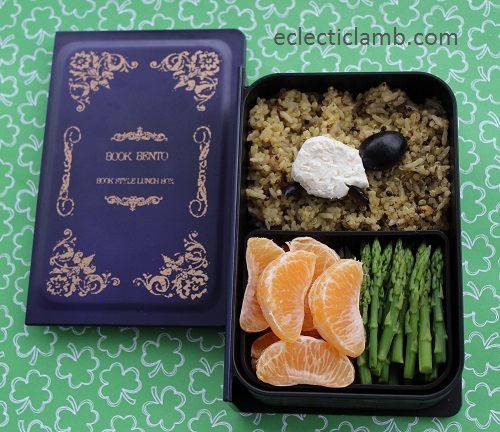 I was proud of this cream cheese and black olive sheep plus it was tasty over a Zesty Lemon Quinoa blend. I know that my mashed potato version of Corduroy looks a little goofy but he makes me smile. The peanut butter button cookies were delicious. 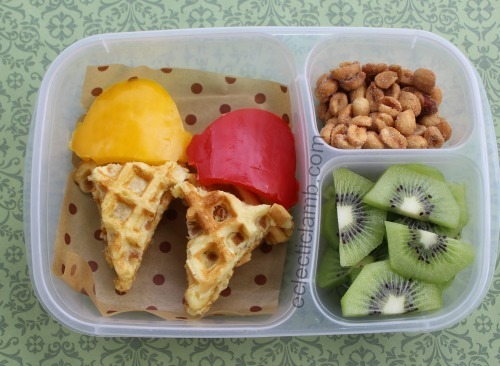 I made these for my nephew who likes bell peppers, waffles, and kiwi. 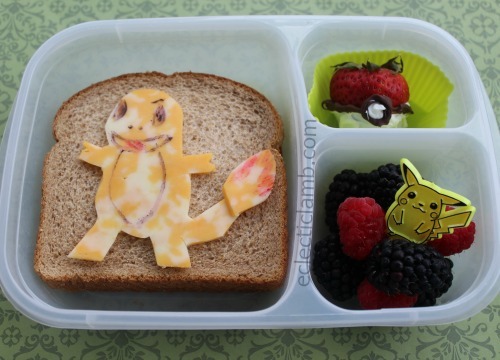 I enjoy making lunches for loved ones. 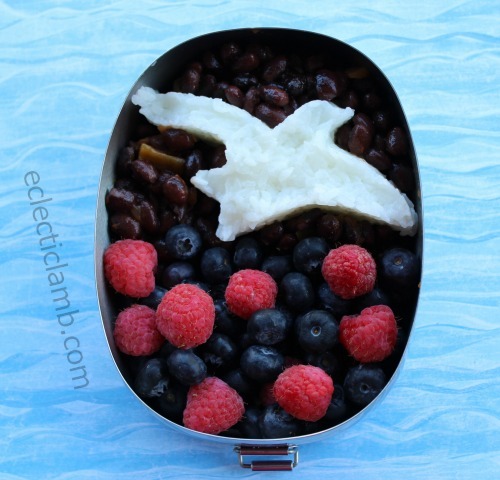 I made this lunch for myself and it received more reader attention than I expected. Sometimes simple is best for design and taste. I made this cheesy mashed potato fish as a meal for my husband to heat up after a long day at work. I hope that the fish made him smile. 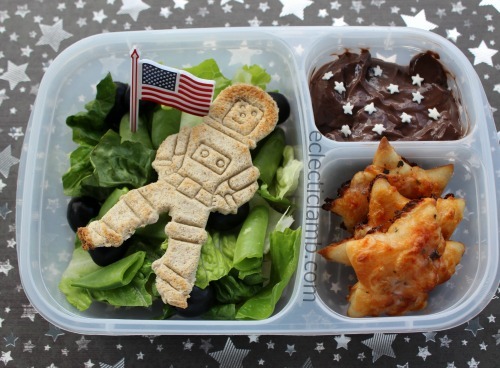 I love my vintage astronaut cookie cutter! 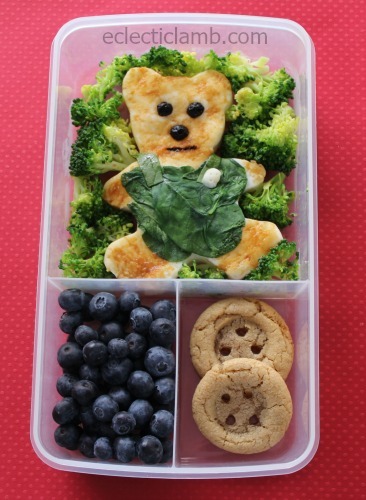 He looks so cute as toast on top of salad. 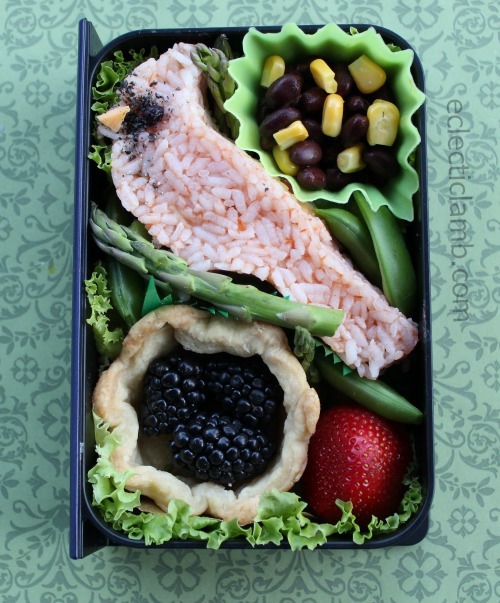 I was very pleased with this Salsa Rice cardinal bento that I made for my niece. I made this adorable broccoli and cheese mashed potato frog for my niece before she graduated from high school. I love the carrot and celery string diploma! 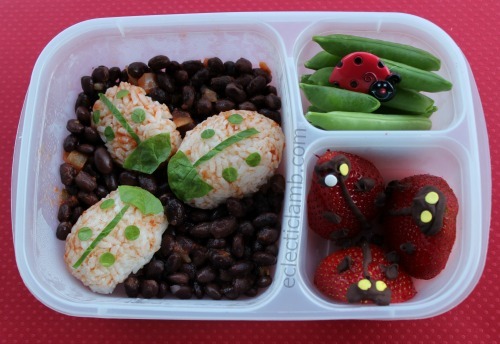 I made these ladybugs out of salsa rice and spinach. They sit on black beans mixed with salsa. 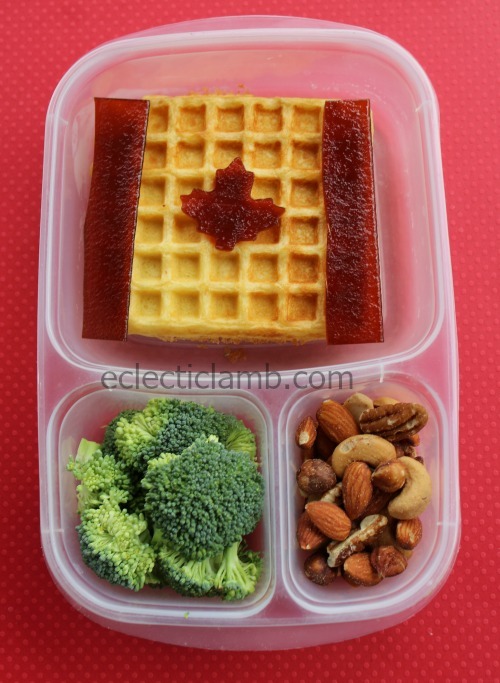 This was part of many waffle flags I made for my nephew. The Canadian flag was my favorite. 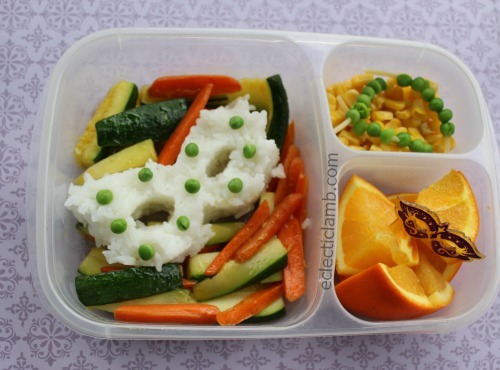 My Dad helped me make this colorful and fun lunch since it was during my recovery from shoulder surgery. He even strung the peas on the spaghetti and cooked it for me! I made this for a young nephew. I love it when I receive food or theme requests. 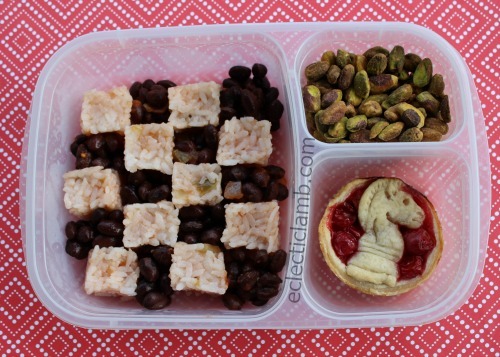 I made many chess lunches this year but this was my favorite. I especially like the mini cherry tart. 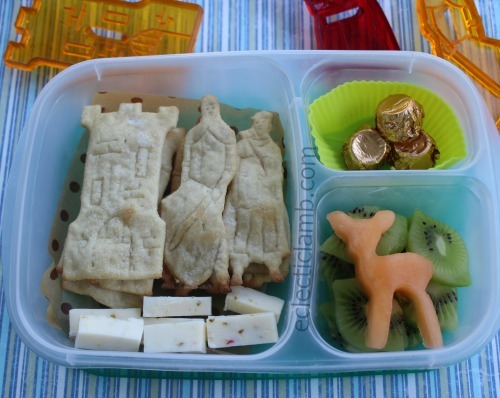 My nephews and I ate Robin Hood themed lunches during one of our summer camp days with Aunt Kathy – good memories! I am glad that I came up with the idea of not baking the mozzarella on the lasagna and adding it later (to melt when heated in microwave). 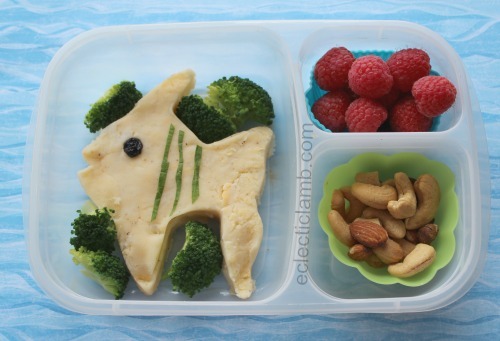 It gave me new theme options for my nephews favorite lunch. I often take on the challenge to present the same food in different ways. 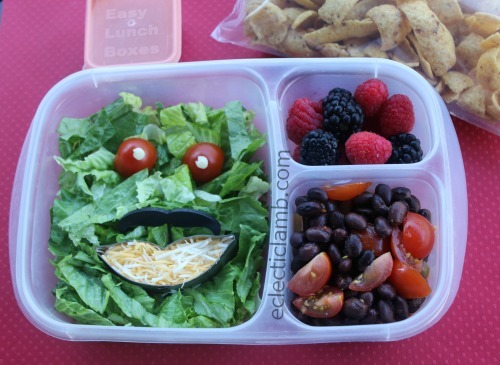 I was delighted with the Mr. Mustache taco lunch I made for my nephew. Happy New Year! May your 2017 include delicious and attractive food. 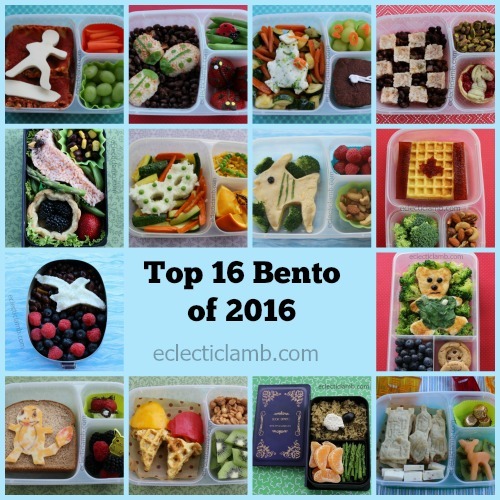 They are all great bentos! I love looking back at these! These are adorable! I am so impressed, as always.I have not been visiting my blog-friends, nor posting on FFF, but I intend to be back. I wish you a great upcoming year, Kathy.